What is Students for Compassionate Living? I could preach about compassion and what it means forever and ever, but this sort of spoke to me in a way that was much different. Being a vegan, I definitely see compassion in everything I do and try to live my life with that as my “mantra” per se. But, compassion isn’t just for the animals, although that’s a huge part of it for me. Everyone know’s about the recent disaster in Japan. Okay, so that last sentence didn’t make much sense, but give me a break! So in conclusion… GET YER SWEET ON! SCL Co-Chair Aly Braden with Carol J. Adams! 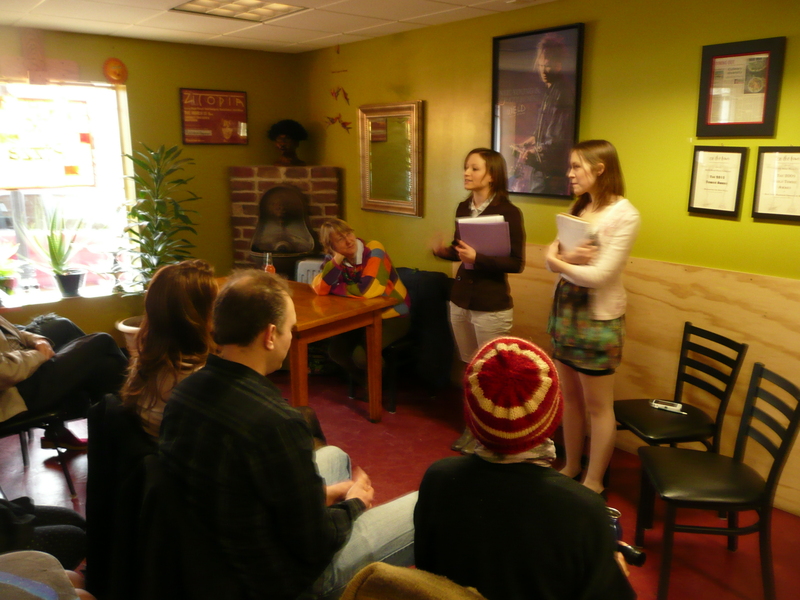 Our own Aly Braden teamed up with Lena Spadacene of the Humane Society of GVSU to introduce and interview Carol J. Adams at a Wake Up Weekend workshop at Brick Road Pizza. Check out other highlights from the weekend in this photo essay. Jonathan Safran Foer On Ellen! A good interview on Ellen where Jonathan Safran Foer talks about his new book, On Eating Animals. On Monday, after legislative approval, governor Grandholm signed a bill the phases out veal crates, battery cages, and sow crates. This is the most extensive protection that any state has passed through the legislative process! Check out Bryant Terry in this short cooking vide0. Can it be done? Soul food…vegan style? Really? I’m here to tell you it can be done, and in anticipation of the upcoming SCL Soulfood Vegan Potluck, I’ll be posting some recipes I’ve found across this world wide web. The potluck will be this Friday (May 1), at the Devos Forum, at Calvin College. SCL is teaming up with our friends at ESC for some events raising awareness about Mountain Top Removal. At 3:30 environmental activists from Appalachia will be talking about mountain top removal and environmental justice at the Devos Forum. The potluck is at five. And afterwards, Dr. Jay McDaniel will be giving the second annual Animals and the Kingdom of God Lecture, at 7:30 at the Meeter Center. So check out some of the recipes, prepare some food, and come on out for a great evening of food and learning! Bring your best vegan Indian dish to share. This Friday, April 17, the potluck will be at 5:30pm in the Library Lobby. Can’t wait. See you there.